It's estimated that 10 to 15 million Americans work from home. Many people, including a great percentage of moms and dads, find the work-from-home opportunity the perfect fit for their lifestyle. Without family support, your at-home business won't survive. The kids must understand the times when mommy or daddy might be home but can't be disturbed. Your spouse must step up to duties you might otherwise assume but can't because of work. Share the household workload. Even if you can do your job sitting on the couch with laptop in hand, creating work space is important. Whether it's an actual office with doors and a desk or a corner of the bedroom partitioned by a room divider, you need an area that's off limits to the kids. Another bonus: Office space for an at-home business is tax deductible. Establish a base schedule: A set chunk of hours, certain days of the week, etc. where you perform the bulk of your duties. This is especially important if you have clients working traditional business hours at an office. But embrace the flexibility working from home allows. Are you an early riser or night owl? What tasks can you complete late at night when the family's asleep, or in the morning before everyone wakes up? Do quick tasks when the baby's napping. Just because you're already home doesn't mean you don't deserve a break. Take a mid-morning and mid-afternoon break, long enough to stretch your muscles, do some breathing exercises, or make a quick personal call. Schedule a lunch hour and step away from the computer. It's so tempting to fold those clothes or unload that dishwasher, but you couldn't do any of that if you were at an office building. Treat your at-home job as you would any other job, avoiding the temptation to do house chores during business hours. Write a job description that highlights your duties and responsibilities, and track your goals. Doing so keeps you on target. Additionally, having an updated resume is essential when you're working from home. Writing a job description makes the task simpler. If juggling multiple duties at once doesn't come naturally, figure out a way to learn this all-important skill. Working from home affords flexibility, but with flexibility comes the need to do multiple duties. Organize your day. White boards and calendars become your new best friends. Also, check out Zoho.com, recently featured on Lifetime Television's The Balancing Act. Zoho has organizational solutions, paperwork, productivity apps, and much more for professionals who work from home. Ah, the joys of taking business calls with a tired toddler at your feet! Don't confuse working from home with being at home. If your budget permits, consider preschool, child care, or other options during daytime hours. You'd do so if your office was downtown instead of downstairs, right? Join a professional association, attend conferences and seminars, and participate in online forum discussions. Networking and staying in tune with current topics within your industry are critical for your professional development. Remember the idea of taking a break that was mentioned earlier? Make one break long enough to allow you time out of the house. Meet a friend for lunch, go to the gym, walk the dog. Yes, it's your office, but it's also your home. You'll burn out and go stir crazy if you don't find a change of scenery. Working from home is a great alternative for many women wanting to balance their personal and professional life, as long as family support and the right mindset and tools are in place. Fantastic article. I work from home two days a week and I fall into these traps sometimes ... especially the doing the laundry one :) Thanks for the good read, I'll use some of these pointers to make myself more productive at home! This was a great article and offered great advice. I started working at home about 4 months ago and it has its ups and downs. The most important part is finding a change of scenery. Staying in the house all day and night will definitely make you go crazy and burn you out quickly! This article was an enormous help to me! I work from home and find myself falling into many of these traps all the time! I plan on putting some of these tips to good work tomorrow at work! Can't wait to be more productive! This is a great article. Once you find an online opportunity that interests you...take the challenge head on. I couldn't agree with you more about taking breaks and stepping out of the home for a while. It does wonders for your motivation and helps to rejuvenate your senses for maximizing your productivity levels. I was looking for a good online business and I found one. I have grown my initial investment over 270% since I started and, although there is a bit of a learning curve, it's a fun environment and a lot of the successful affiliates are very willing to assist the newbies grow their business. I highly recommend checking into it as the income is derived from a revenue-sharing program based on a penny auction. Something I really need to do is sort out a dedicated office/working space, I currently work from the sofa which leads to many distractions! This really is helpful. For a internet marketer like me who is kinda a newbie this helps me to relax. My biggest problem is once i sit in front of the laptop I do not move from it all day. By the time I move, my eyes hurt and its dark outside. I am learning to take breaks and fresh air. Tip number 11. Make sure to pay your bills on time and find other ways to cut your bill in half. If you use a phone to communicate with clients, find the cheapest plan out there ! Tip #11 - Block the urge to post blank postit notes all over your home office LOL : ) I couldn't resist. Anyway, great tips. Thanks for sharing! Nice post.One of the main hurdles in working from home is that people start taking you for granted. They think that since you are at home, you will be available any time of the day for leisure activities. One should be very firm on this and be clear that working from home is serious business and should be pursued like any other business. Another thing that should be avoided is not to mix household chores with your business. Great post! #1 in particular. I can't tell you how important it is to have everyone on board with what you're doing. Makes life just a little easier. Working from home is a tough job. I am not a work at home dad, I am more like a work at home son. So when I am working on my laptop everyone knows that I am working and they co-operate with me. But people who are outside like friends/neighbor/relatives, they don't understand the work at home thing so they will just come over and interrupt. But that's the small price to pay for this freedom lifestyle. I am saving an average 4 hours everyday of commuting time and I get breaks whenever I want. Getting your family on board is a tough one for me. Having the kids run into the office when I'm talking with a client was embarrassing. I learned my lesson the hard way. great article. 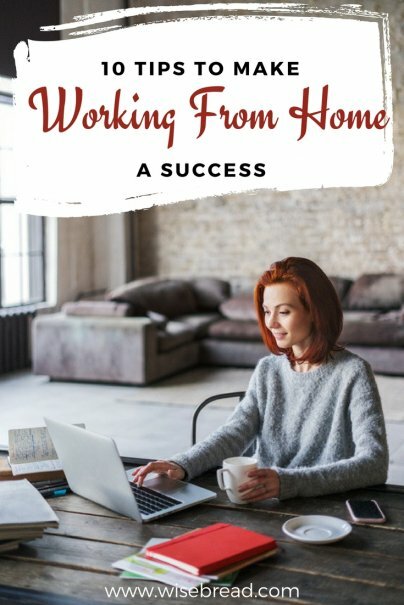 I have started my freelancer home business recently and was looking for getting some tips that can help me setting up my workplace. After reading this article I am satisfied that I can adopt any one of these.. Thank you for awesome post.